Sonny Bono’s 1965 song “I Got You Babe” romanticized love without money. Young people all over the world with stars in their eyes and nothing in their pockets identified with the catchy tune. They were young, just starting out…. But you aren’t! Listen up. Estelle is 72, a widow, with three grown children and a younger sister who are the beneficiaries of her Revocable Living Trust. After a long time living alone, Estelle is excited to experience romance. She is considering a marriage proposal. But she wonders what issues a new marriage would raise at this time in her life. This article addresses a few of the many legal effects that marriage has on older Floridians. he will sell the home and keep one-half of the proceeds, with the remaining proceeds going to Estelle’s descendants, but not Estelle’s sister. A valid prenuptial agreement can preserve Estelle’s estate plan. Veterans’ Long Term Care Benefits. If Estelle is the widow of a Veteran who served during war time, she would, upon remarriage, no longer be eligible to be considered by the Veterans Administration to receive a pension of $1,149 per month. This pension, referred to as Aid and Attendance, helps thousands of widows pay for care in assisted living facilities. But all potential benefits are cut off when the widow of the war time veteran remarries. Medicaid Long Term Care Benefits. The average cost of care for one month in a Florida nursing home is $8,662. If Estelle’s new husband needs nursing care and applies for help from Medicaid, then Estelle’s own assets are considered along with her husband’s to determine whether he is eligible. Prenuptial agreements do not shield the healthy spouse’s assets from consideration in determining Medicaid eligibility. However, a prenuptial agreement certainly would help Estelle leave the marriage with her assets if a “divorce” occurred. 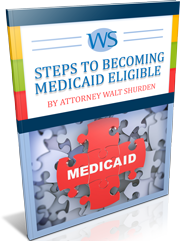 Without a doubt, Medicaid eligibility planning is complex in second marriages. For example, Medicaid allows unlimited transfers of assets between spouses. But in a second marriage, where each spouse has different beneficiaries, it may be folly to transfer the sick spouse’s assets to the healthy spouse who then controls who ultimately inherits those assets. Alimony is another serious issue. If Estelle’s new husband is paying alimony to his ex-spouse, Medicaid, despite the Court order of alimony, will not reduce his required nursing home payment by the amount he must pay his former wife each month. This can have the very unfortunate effect of forcing Estelle to pay the first wife’s alimony or alternatively, go back to court to attempt to reduce the alimony, eliminate the alimony, or provide a lump sum payment in lieu of further alimony. Before you remarry, go to an attorney to understand how your current assets and plans would be affected. Prenuptial agreements can help you control what happens to your home and savings at your death or in the event of a divorce. But Medicaid and VA benefits are largely unaffected by these agreements.